DO THE DUCTS IN YOUR HOME OR BUSINESS NEED REPAIRING? The ducts in a home or business are hidden under the floors, in the walls and attic and in crawlspaces. Although they are out of sight they are certainly not out of mind, they are a critical component of a well functioning heating and air conditioning system. As the home ages there is a distinct possibility that there will be deterioration of the ducts; small holes may appear and the joints may separate, the result is poor air circulation, degraded air quality and high energy bills. 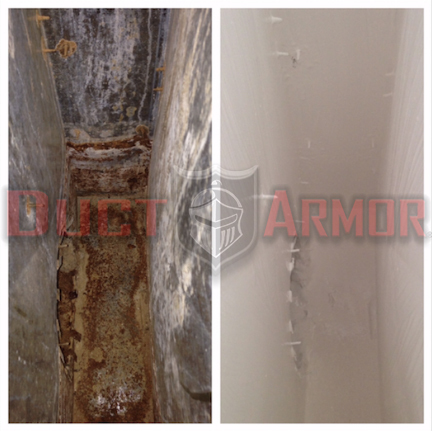 Duct Armor’s patented duct restoration is non-invasive and eliminates the need to cut up the foundation of your home. Remodeling of the interior or the relocation of air ducts into the attic is not necessary with our solution. All of the work can be done while you are in the home. The coating material is a proprietary water-based latex material that contains zinc. Our product will inhibit the growth of any mold or bacteria, without the use of poisons. Duct Armor has been rigorously tested for safety including fire safety and out-gassing, etc. Duct Armor is so safe it is classified as a non-hazmat material for shipping. Duct Armor will make air ducts air tight which will satisfy the new energy regulations, including HERS testing. This means immediate energy savings for many years to come.